I read with sadness of the death of the Hollywood producer, writer and director John Hughes on August 6th. I then spent the weekend indulging my nostalgic streak by viewing his three most important films: Sixteen Candles (1984), The Breakfast Club (1985) and Pretty In Pink (1986), and saw again what a politically vapid but emotionally poignant period this was for film, and one which provided the entire soundtrack to my childhood. 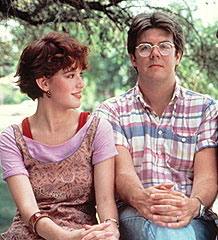 Hughes’ innovation was to abandon the standard model of the teen comedy as farce, exemplified by films like Animal House (1978), and bring the principles of the romantic comedy to bear on the American high school, running them through the wringer of adolescent angst and the youthful drive for social acceptance. It is also true that these films, despite their nods to the rebellion films of Marlon Brando and James Dean, actually marked the return of generational deference. The strident student politics of the ’60s and ’70s were now replaced by an urge to understand one’s place in one’s largely suburban middle-class peer-group, delegating more serious international and domestic matters to the grown-ups. At their heart, the films offer a fantasy of what people wanted their lives to be, or to have been, when they were at their most open, honest and attractive. Even teenagers watching at the time knew they were fables, which was why they inspired a loyalty which has increased rather than dwindled with the passage of years. Their innocence—political and economic—and their idealism about human relationships were lapped up by an already cynical younger generation who knew all too well that they were not true. It must at least be in part due to this that so many of the fine actors—the so-called “brat pack”— working on them have failed to live up to their promise. For they were exactly what their characters were meant to be: open, honest, attractive and working on their first breakthrough films which happened to have both good scripts and directors. Any attempt by them to move on—to sink their teeth into meatier dramatic roles and break out of the typecasting they were falling into—could only feel to a smitten audience like a betrayal of the dream they had conjured. And so it was with her fans. Having disappeared to Paris at the height of her fame, and filming a French version of King Lear there with Jean-Luc Godard, she returned to the US in 1988 with For Keeps, in which she asked her fans to watch her get married, have children and enter the perceived drudgery of real life—which they refused to do. Even with hindsight, it is very hard to see what she could have done. Although she has continued to work on screen and stage (including in London’s west end), she has never returned to those dizzying heights. I guess that the trouble with nostaligia is that, in the end, reality always wins out. And the reality here is that pure escapism in the arts is a trap: both for those who seek it out, and those who create it.